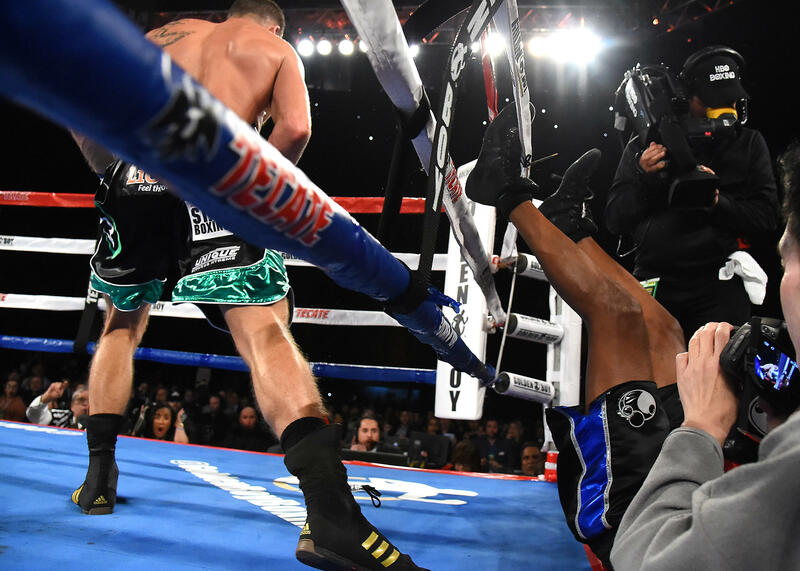 INGLEWOOD, Calif. - Joe Smith Jr. stopped Bernard Hopkins 53 seconds into the eighth round of their WBC international light heavyweight title fight Saturday night. Smith used a six-punch combination to send Hopkins through the ropes and on to the floor, effectively ending the 51-year-old’s 28-year boxing career. Smith successfully defended his title when Hopkins was unable to return to the ring after 20 seconds. Hopkins hit his head on the way down and twisted his right ankle - he cited the ankle as the reason he couldn’t finish. A WBC official said the injuries incurred forced a TKO. Hopkins was reluctant to accept the outcome, initially claiming that he was shoved out of the ring. “I was throwing the right hand and a combination and then using the rope as an offensive as I’m known for, and making a mess,” Hopkins said. “He got frustrated, and I might have gotten glazed with a left hook and next thing I know he was throwing me out of the ring. Hopkins (56-8-2) was looking to wrap his career with one last showing of defensive-minded boxing in front of an enthusiastic, star-studded crowd at the Forum. Instead, he finished in the same manor he started, with a loss. Wearing his old Executioner shorts as a throwback to his earlier fighting days, Hopkins looked his age early as Smith (23-1, 19 KOs) was the aggressor to start. Hopkins regained some footing in the fifth and sixth rounds but Smith gained momentum and took it with him through the eighth, when he pummeled Hopkins in a corner and sent him through the ropes. In his prime, Hopkins won a record 20 consecutive middleweight title fights. He became the oldest-ever champion when he defended his light-heavyweight belt at 49. However, Hopkins hadn’t fought in more than two years, losing to Sergey Kovalev on Nov. 8, 2014, in his last bout. Oleksandr Usyk (11-0), a 2016 Olympic heavyweight gold medalist out of Ukraine, successfully defended his WBO cruiserweight title with a knockout of Thabiso Mchunu (17-3) with a knockout in the ninth round, his 10th. Local El Monte product Joseph Diaz (23-0), wearing Lakers colors in their former home, defended his NABF featherweight title, beating Horacio Garcia (30-2-1) of Mexico in the NABF featherweight title by unanimous decision.